For more information on any of our artists, exhibitions and to contact our gallery in Chelsea, please see below. Approximately 15 minutes from the West End of London. 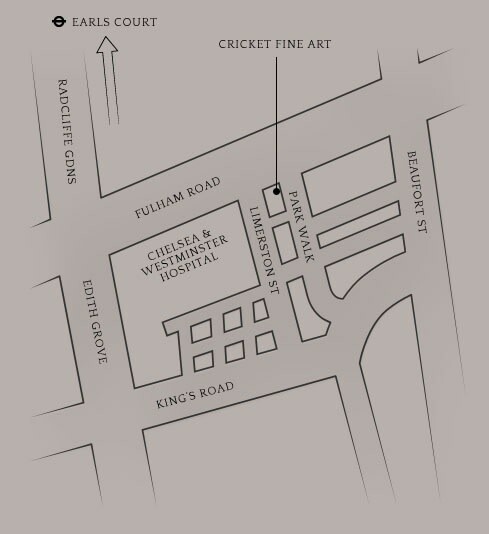 The gallery is equidistant from South Kensington (Piccadilly, Circle and District Lines), Gloucester Road (Piccadilly, Circle and District Lines) and Fulham Broadway (District Lines), with Earl’s Court (District and Piccadilly Lines) slightly further away. All are a 10–15 minute walk or short taxi ride. From the West End, take no. 14 (Green Park) or 414 (Marble Arch, Park Lane, Hyde Park Corner), alight at Fulham Road / Chelsea & Westminster Hospital; no. 22 (Old Bond Street, Piccadilly, Green Park) alight at King’s Road / World’s End. From South Kensington Tube, take no. 49 or 345, alight at Fulham Road / Beaufort Street. The nearest docking station for ‘Boris Bikes’ is 50 yards away, at the Fulham Road end of Limerston Street; there is another docking station 200 yards away in Drayton Gardens.